Image by the publishers Currier & Ives. 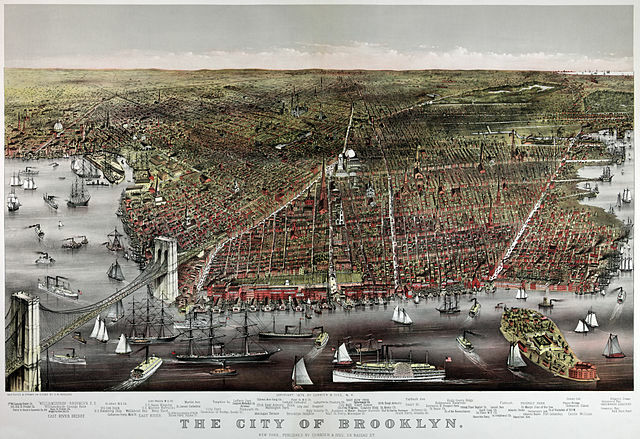 The city of Brooklyn shown in a birds-eye view as it appeared in 1879. 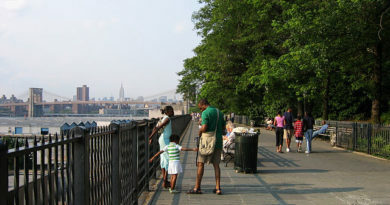 In 2012 a huge fire devastated a rent-stabilized apartment building in Prospect Lefferts Gardens. Although six long years have ensued, the tenants have still not seen compensation for their lost property, nor have they reached any agreements connected to the rent stabilized status of her old apartment, which she has been paying $1/month to keep. One hundred and seventeen households were forced to leave their fire-damaged apartments, and in many cases needed to move to smaller apartments to afford the rent. Some have had to move several times over the course of the six years. Twelve of those families filed a lawsuit against the owner of the property, Kings & Queens Holdings, for millions of dollars in damages. Simultaneously with the filing of the lawsuit, the owner has started early talks with the city about rebuilding. The company prefers to knock down the old building to make way for another building the same size or larger, claiming that repairing the old building will cost more than just starting over. In order to construct a larger building, or even one of the same size, the area would have to be rezoned. The attorney for the tenants, Steven Wagner, said for the past six years the owner let the building deteriorate, not lifting a finger to repair or replace it. Now, six years later, that the neighborhood is becoming more sought-after, Kings & Queens Holdings has begun to consider what to do with the property. The executive vice president of the parent company of Kings & Queens Holdings, Joshua Eisenberg, said that the majority of tenants have already reached a deal, while a smaller fraction have not yet reached a resolution.